Yeah, I can just go ahead and say it now that Missouri is in the SEC. 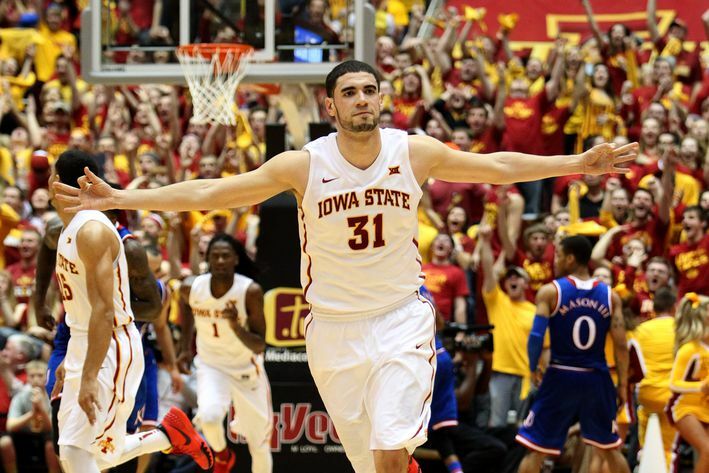 Kansas' biggest rival in Big 12 basketball now belongs to Iowa State. I know that nationally some might still think it is Texas, but here around the Midwest we know that itsn't the case. Iowa State and Kansas have put on some memorable shows since Fred came to town; in fact they've had it all....high scores, OTs, desparation shots, controversial calls, suspended refs, and even blood gushing on the floor. Yes, whether you like it or not this is now the #1 rivalry in the Big 12. Bedlam..eh, K-State vs KU...boring, Texas vs Kansas...nope, it is all about the Cyclones vs Jayhawks! No matter how long you look, you aren't going to find a reason that it won't continue long after this year either. Neither Hoiberg nor Self look like they are interested in leaving the schools, which mean we are all blessed for years to come watching the recruiting battles, ranking status, and ultimately the head to heads which will determine who wears the conference crown. Yeah folks, buckle up because this is just part two of what very well could be a three game series between the national contenders. Both teams know what is at stake tonight: A Big 12 Championship. Kansas is going for its 11th consecutive, while Iowa State wants to reclaim that honor. If the Cyclones win tonight, they will have beaten the Jayhawks 3 consecutive time, which they haven't done since they won 5 in a row back in 99-01. In order to do that, they are going to have to win on the road in Allen Fieldhouse a feat that hasn't been done more than 10 times under Bill Self. Allen Fieldhouse or not the Cyclones don't like the road and have dug a hole in 2 out 3 Big 12 road games. If they do that in Lawrence kiss a comeback goodbye (unless you are Oklahoma). Bottom line: This game is one of the most anticipated mid-conference season games that Iowa State has played. If they win they are in the drivers seat and will be getting lots of love from the nation. Lose, and you find yourself playing catch up and hearing the country talk about how you are a Sweet 16 team at best. Prediction: If Bill Self hits the video board more than 5 times the Cyclones win. He hits it 6 tonight!